Regimental Combat Team 7 was replaced in Afghanistan today in a relief-in-place ceremony, as hundreds of Marines providing support to grunts in Helmand province prepare to return to bases and stations all over the West Coast. The regiment, based out of Twentynine Palms, Calif., and commanded by Col. Randy Newman, leaves behind a Marine Corps footprint that is much different than the one it found in Afghanistan last fall. While its battalions have recently been based in Marjah, Garmser, Nawa and surrounding areas, it oversaw some of the largest Marine operations in Afghanistan within the last year, including the February 2010 assault on Marjah (Operation Moshtarak) and the December 2009 assault on Now Zad (the sweetly named Operation Cobra’s Anger). 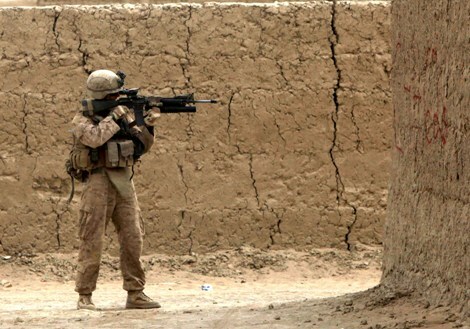 Marjah, in particular, continues to be a slog, with regular firefights and dozens of Marines killed there this year. RCT-1, out of Camp Pendleton, Calif., will take over for RCT-7, overseeing 2nd Battalion, 9th Marines, and 2nd Battalion, 6th Marines, both out of Camp Lejeune, N.C., in Marjah; 3rd Battalion, 3rd Marines, out of Marine Corps Base Hawaii, in Nawa; and 3rd Battalion, 1st Marines, out of Pendleton, in Garmser. Like RCT-7, RCT-1 will be based at Camp Dwyer in Garmser district. It will be commanded by Col. David Furness, who is perhaps best known as the former battalion commander of Pendleton’s 1st Battalion, 1st Marines. In 2005, Furness commanded Battalion Landing Team 1/1 when it was in Karma, Iraq, as part of the 15th Marine Expeditionary Unit. He talked about that experience at the National Press Club in Washington in remarks last fall that are captured here. Nuala, Try giving the Red Cross a call. They can normally find out what you need. Does anybody update this blog? I want to keep track of what is going on with RTC-1. Anyone have any other site suggestions. a marine dad.